Aquarium stands combine function and decor. They provide elevated support for your showcase piece of "living furniture" but they also serve as valuable storage for aquarium accessories and equipment. Choosing the right stand is really a matter of deciding the size that best fits your space, your furniture style preference, your budget, and the amount of storage space you need. Most importantly, select a size that properly supports your aquarium. The following tips will help you determine the best location for your setup and prevent having to move it later. Check with a reliable source (preferably in the construction business) to make sure your floors are structurally sound and can support the total weight of your system. An aquarium filled with gravel and water weighs approximately 10 pounds per gallon. Place your setup on a sturdy and level surface. 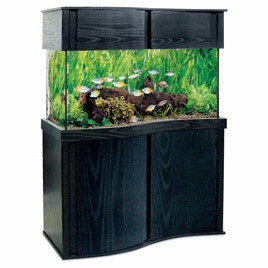 Give yourself sufficient access around the aquarium for cleaning and maintenance. Consider the location of necessary electrical outlets. Place in close proximity to a water source for convenient water changes and top offs. In the way of heavy traffic or an area where children play. In an area that receives direct sunlight. Doing so may contribute to high temperatures and unwanted algae growth. Near heat registers or drafty areas that can cause unwanted temperature fluctuations. In an apartment or rental unit without prior approval from the housing manager.